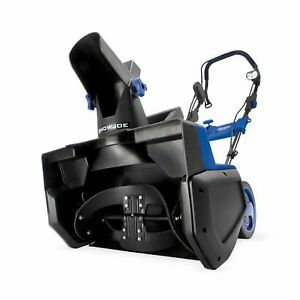 If you have a mid-sized driveway or walkway and moderate snowfall, you might want to consider this Snow Joe Ultra Electric Thrower. 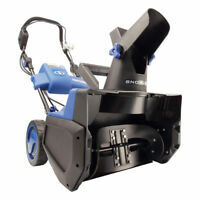 It is easy to use to clear snow quickly and requires no gas, oil, or tune-ups. 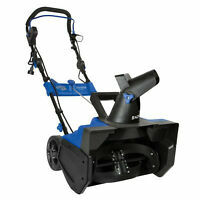 Also, it comes with a 3 Watt LED light so you can clear snow in the dark safely. 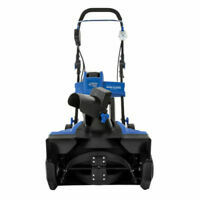 The powerful 15-ampere motor is rated to move up to 800 pounds of snow per minute. ssembled and appears to be okay. Sno Joe is working fine. I’ve used it twice and is doing exactly what I need! A+++ Exactly as described Will buy again Thank You!! This is my second product from this company. Great customer service. Solid made. 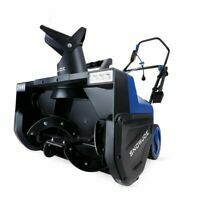 Light weight and very easy to use! My brother thought I was just plain silly to buy this...until the show finally came down. He struggled at first to adapt to the way it worked. He finally (actually) read the 'easy' to understand operational instructions and he was thrilled. (ha ha) No more shoveling!!!!! Cheap. Works well if the snow is fluff. Doesn't work on wet heavy snow. No adjustment for the spinning rate. Shell is made out of plastic mostly, long gevity may not be its selling point. I haven't had any snow yet, so I have not actually used it. Buyers should be award the body is made of hard plastic as are the blades. It was easy to put together, took me about 30 minutes. I have an average size driveway and average amount of walkways and I expect this will do the job well. I suspect it will hold up to what my job needs are. I was able tp clean off the driveway quickly after a 5 inch snowfall. It is easy to operate and the power is pretty good. It does bog down which causes the engine to overheat and shut down. It was the first time using it, so next time I will take it slower so it doesn't overheat and shut down. It was a good value so I would buy it again. It beats spending an hour in the cold with a shovel. product arrived in one day, very impressive! works well for my decks, moves about 6" per pass. The quality of the snow direction on top is weak, it doesn't stay in place with force of snow and bolts sent with product don't hold it in place, bad design. Overall i'd recommend it for decks, did a good job.